In these pages I want to share what I have learned over the years about surviving loss, change, anxiety and life in general with Christ. Yes, it’s the account of my wonderful dog, Bogey, but it’s also about my radio career and so much more. It’s a story of hope that captures the happy moments when I truly realized I wasn’t alone. It’s a collection of moments about the transformation that God orchestrated in my life and with my pack. Transformation that only He can bring. Ordered on Amazon or for your Kindle? When Jesus Shows Up and Transforms Your Pack. Order your book from TheRescuedBreed.com and you will receive a copy signed by Stacey and Johnny Stone along with Hidden Chapter about how she and Johnny keep their marriage on the happier side of life. 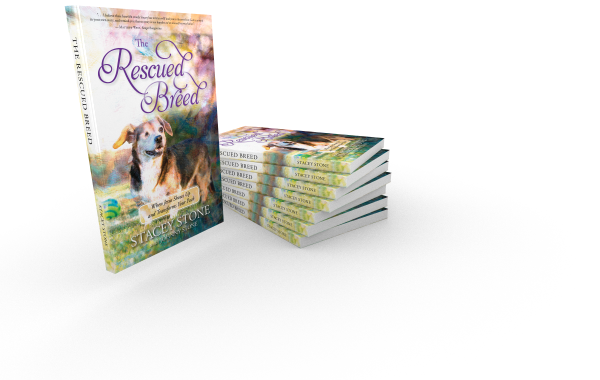 Order five books in your original order from TheRescuedBreed.com and you will receive a Skype session with Stacey for the group that you provide with the books. Get insightful questions that will help you and your small group or reading club. "As a songwriter, I am driven by a passion for the power of a story. My friend Stacey and her husband Johnny share that same passion and have been voices of hope reaching millions of people through the radio waves over the years. I am so excited for this new book and the stories it holds. I believe these heartfelt words Stacey has written will lead you to discover how God is at work in your own story, and remind you that no story is too hopeless to be rescued by your Savior.”"
"...Stacey's voice is uniquely suited to draw in strangers and friends alike... 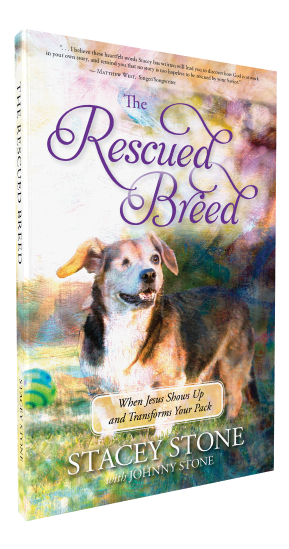 The Rescued Breed, When Jesus Shows Up and Transforms Your Pack, is one of those books you give to people you love, people you pray for, and people who seem to be stumbling along life's path with no direction. That seemed to be the path that Stacey Stone’s writing was going to take until Jesus stepped in and took the reins. Writing for magazines, enewsletters, and various press releases fed her need to write but her story was not being told. This Christ-follower, Texan, wife, dog human and aunt was living in God’s favorite sitcom and at the insistence of her husband and friends began writing down what God was doing in her life. The result is The Rescued Breed: When Jesus Shows Up and Transforms Your Pack. Currently working on her fourth and fifth book, Stacey simply wants to get the word out about how you can survive what you are going through now and with Jesus it can be a good result. From her kitchen table, Stacey invites you into the larger story of changed lives each weekday on Family Life Radio with her wonderful husband Johnny Stone.